Culms: Erect, glabrous or rarely slightly rough. Leaves: Blades occasionally reaching inflorescences, up to 1/4 inch wide, glabrous. Inflorescences: Spikes, central 1-3 sessile, lateral 2-10 spreading or slightly ascending on unequal rays to 3.5 inches long, condensed, hemispheric or ellipsoid. Flowers: Spiklets 5-15, ascending, flattened, 1/2 to 1 inch long, to 18-flowered, radiating from common point; scales ovate, 9-15-nerved; margins rough; tips abruptly short-pointed. Fruits: Achenes, ellipsoid, 3-angled, less than 1/8 inch long, pale brown, 1-seeded. Comments: Rhizomatous. 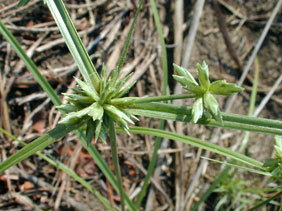 Cyperus xmesochorus is a hybrid between Cyperus lupulinus (Spreng.) Marcks and Cyperus schweinitzii Torr. It is common and widespread.